This is a 192 sq. ft. barn shed that was converted into a beautiful 192 sq. ft. tiny home that is being shared by one of our wonderful readers named Stacy Thompson. Included below is an interview with this tiny homeowner so you can learn the story and motives behind this tiny little cottage. What was your main motivation for building the cabin? Well, I turned 73 this June, and I wanted to have my own place to live in if/when I can’t earn money any longer. I’ve got a small business that supplements my social security, but if something happens and I can’t keep working, I won’t be able to pay my mortgage and bills so I’d need to rent the house or lose it. And I want to be able to live in my own sweet little garden cottage with my dog, and not end up being a burden and living in somebody’s spare bedroom (even if they love me a lot). How did you do it? Did you use a barn shed as the base and convert it? Yes, Better Built Barns (contracted through Lowes) built it and then I hired friends to finish it. For how long have you been planning/wanting to do this? I always thought my little 20ft. Dolphin camper would be my “back-up/I’ll never be homeless” plan, but I sold it last Spring because I wasn’t using it to travel with my friend to dog shows anymore. When I watched it being driven down the lane, I felt like a deer in the headlights. Oh crap, there went my backup plan! After it went up (in one day) a contractor friend came and dug a trench from my well house to the barn. Then he wired it (I even helped “pull wire” which I’d never done before) and plumbed it for me. Another friend did the drywall, finished the stairs and did all the wood trim and beadboard. How were you able to find a spot to put it? It’s on the back of my property behind my goat shed and pasture. About $7000 for the initial build, then ??? I don’t really want to know (lol) maybe another 10 or 15 to finish it completely. My goal is to get finished while I’m still making money, so it’s ready for me when I need it. If I stop working, I’ll be living on about $600 a month, so I won’t be able to do any more building then. How long did it take you to build it or have it built? It’s been a year this month. What are the barn cabin’s dimensions and approximate square footage? Is this where you’re now living full time? Nope, it’s more like my (a recently coined phrase?) “She Shed”. I’m growing a lovely little garden back there and I love to hang out and read or sew and listen to music and dream of retiring some day. Maybe at 80 or 90??? Hey, you can’t blame me for dreaming. I adore it. I love being out there. I don’t want to go back to the main house when I’m hanging out in it. It’s like being in a whole different world. I love the thought of having such a sweet space for my dog and myself. The older I get, the more I feel the urge to lighten my load of stuff. In the process of raising a family and living life all these years, I’ve accumulated so many things that are holding less and less appeal for me as I get older. Being surrounded by only the things I need and love is more seductive every day, and I’m working in that direction. If there’s anything you learned that you can pass on to others from your experience, what would it be? On a practical level?….. the skylights are a huge plus. They bring in so much light and that high ceiling makes me feel like I’m in a wide open space, especially when I can look up at the trees and sky, or the stars at night. Oh, and the french doors too! I asked for them at the very last minute and I’m so glad I did. In a small space, things are up close and noticeable so going for the special touches that meant a lot to me was important. I’m only 5’4″ but I’ve got several family members who are over 6’3″ so I made the walls 7′ instead of 6′. Ah, the deck! Since it’s a barn instead of on wheels, the covered deck was a wonderful addition. It’s like a whole other living space, especially in the warmer months when the doors can be left open. In the cooler months, I can bring the more tender plants under cover too. The loft was a must because even if I’m old and messed up I’ll still want family and company (heck, probably even more then, right? 🙂 so it’s a lovely space for guests….) or my Hospice nurse for that matter! Yes, I hope to die in it…..with my dog and my music and my flowers and my loved ones around me. By the way, in case you’re wondering, I’m in great health, don’t take any drugs, eat well, and hit the treadmill for an hour a day. But I have no crystal ball so I’m trying the best way I can, to provide for myself in the future. And finally, what’s the best thing about your tiny house? What does it give you that maybe you didn’t even expect? It’s my sanctuary, my safety net, my solace, my retreat. I’m beyond blessed to have the security of knowing I can grow older on my own land, in my own forest, with my dog and my garden and my music. I know that’s probably not the kind of answer younger people would give, but I’m not a younger person anymore so that’s my answer. Hope some of this was useful to you. Our big thanks to Stacy for sharing her wonderful tiny home with us! Love the house, love the advice and certainly love and admire Stacy and her grit! What a great article. The home is lovely and when you see it – it’s like you know Stacy. Thanks for sharing. Wonderful! I like everything about this “barn”. I’m bookmarking this for future reference! Sweet little place. Thanks for all the pictures!! Love the house & all the inside touches & everything. It looks much bigger than it really is! I love your barn home!! You have squeezed a lot into a tiny space! Well done! I hope you have many happy years there! Great Job on the house. Your story is inspiring! Thanks for sharing it. Stacy, Thank You so much for sharing. I love your idea, and most important, your outlook. I want something a little bigger, but exactly the same game plan. Chicken coop, garden, and a small workshop. I love working on old trucks. Stacy echoed my feelings on possessions. Though I’m twenty years younger, I totally agree about the necessity to lighten one’s load. Love Stacy’s pragmatism and peppy attitude. I am so full of admiration AND envy!! You have done exactly what I would love to do. Your attitude toward WHY you did it mirrors mine so closely that it was scary. Though I hadn’t thought of the Hospice Nurse angle. LOL That was priceless, even if, as I suspect, it was not really a joke. How lucky you are in having a large piece of property on which you can stay forever, even if you have to sell the big house one day. How fortunate you are in having resourceful friends who could do the things you cannot in getting your tiny house together. But best of all, you are blessed with fortitude and a sense of humor! And, oh by the way, I love the house too Stacy. Nicely done!! I love this tiny home. It is a lovely shape and looks bigger than the measurements given. I am glad you are enjoying it now, I preparation for when you will actually live there. I am 56 and realising I need LESS STUFF, not more, as I am getting older. Stacey’s dog seems to like it, too! I enjoyed your article. I felt the same way about my property and have built guest cottages here. I knew I would want to have a back up plan because with a daughter in New York and a slippery slope son that I might not be able to depend on I had to make a plan for my retirement days. I think it is great what you have done in getting ready to leave the big house and all of it’s upkeep. It drains time and energy from our lives. Living more simply feels right after the kids are grown. I know I did not like empty rooms so as a designer I made them guest suites and I rented my rooms to business men coming in to town for relocation. Those rents float my house and has sustained me while I recovered from being hit by a car on my bike. It made it possible for me to continue my charitable giving. They are very nice men not creepers so it is like living with brothers which I like very much. When I am ready I will transition to the tiny home like you are also going to be doing at some point. I agree. It’s a good plan sister. This is adorable and I greatly admire Stacy for her outlook. This one gives a since of peace and is going to be added to the idea file as well. This place is so inviting and cozy, makes me want to put on flannel pj’s and drink cocoa and cuddle with that beautiful dog!! I’ve had several careers, several children, lots of pets, one husband and one fantasy – to have a tiny house to retire in and travel to visit family, taking it with me…who knows if that wish comes true? I am downsizing gradually – and Stacey is now my inspiration. I will turn 65 soon, so I better get crackin’! Thank you for sharing, Stacey! Did you have to put in a septic system? I love this little place! Hi Nancy, thanks for the kind words! Right now I’m using a simple composting toilet. I did a lot of research on them and am very happy with the very basic one I ended up with. You can find links for them in a lot of Alex’s articles. What they say about their ease of use and lack of odor is all true if you follow the directions for installation and use. Good luck. I could live in this beautiful home. You’ve done a wonderful job, and I agree, what else do you need when you have a beautiful and practical home, a garden, music and your dog. You’re blessed. This is the most beautiful tiny home I have seen to date. I love pretty much everything about it. Thinking of converting the garage for just the same purposes…and will incorporate some of the touches here. It also opens out onto my garden. Good job Stacey!!! I’m so glad to see how someone has used a shed that anyone can buy and turn it into a functional living space. I’d like to see more of these. Beautiful home and great for grandparents who want to be independent but need a little assistance. Keeps the families separate when everyone needs some private time. Wonderful job and thank you for sharing. Thank you for sharing your beautiful house. You’ve built it for the best of reasons–low cost, independence and to enjoy as you get older. I hope to join this “club” soon! This is my plan!!! I have, at least, another 20 years of working, but I’m already thinking about how I will live in my retirement. My goal is to live as simply and as inexpensively as possible. Stacy has thought everything through and I’m very impressed the result. I would, however, have to make one adjustment. I would have to have my bedroom on the first floor near the bathroom. My bad knees wouldn’t be reliable dealing with narrow stair in the middle of the night. Other than that, it’s perfect! Simply love Stacy’s sanctuary and thinking ahead attitude. God Bless! I had to laugh when I realized that I was wearing the exact same socks at the person in the pictures. It is all about the comfort at this stage of the game and that tiny house looks very comfy. I am so jealous! I think it is wonderful what you have done with this space. Its exactly what I would love to have! I LOVE this house ! I’ve always said I’d never want a loft since I’m disabled now and don’t know that I’ll be able to climb stairs much longer, but this looks great even with the loft. It looks SO much bigger than what it actually is ! What a great little home. We share the same dream, a small place to call my own and that won’t cost much to live in. Great vision, I applaud you ! This is in the top 5 of my all time favorites of tiny homes ! You did a wonderful job on this space! The layout is great – it feels homey and never would believe it was 192 sq ft.
Just love it! Love the way you did the stairs and the porch is a good touch.. Thanks for sharing not only the pictures but your story as well. Exactly what my future plans are at almost 63. Luckily, I can do most of the work myself, at least so far (knock on wood)! Last summer my partner and I did basically what you did for a friend’s veteran daughter. We were restricted from a lot of creativity, but it turned out nice. I need to find my pictures and submit them to Alex also. It was meant to be more rustic and cabinish. That was the guidelines and restrictions placed on us by the friend that paying the bills. i would really have loved to have done things a lot differently that we did. But the daughter is living quite comfortably there now. I think this is absolutely beautiful! It could be my dream home. Wonderful idea and rehab! Does the dog come with it?? I am also converting a small shed. Although it’s larger, 14×26, there is no room for a loft. I like the way you finished yours, always looking for ideas. Also on tight budget, so using as much reclaimed items including wood as I can. I had looked into getting a barn like that and this is a LOT like what I would have wanted to do as well. For me, it’s a toss up between that and a tiny house on wheels. I think you could put one of these on wheels, too. It’s so story-book like, I really like it and the porch. Oh this is a lovely home. I would want it all the same too. Just perfect for someone who enjoys nature, cozy and fit for one with a sweet pet. I love this little barn house. What a great idea and so nicely done. Such an inspiration for me for the future. Thanks Stacy!! Wonderful, wonderful! I absolutely love this. So cozy and inviting. Would love to have one just like it. Have been thinking about doing something similar in the future. So many great ideas. Thank you for sharing your lovely home with us. Great garden too! I flat out LOVE this place! Charming! Comfortable! Imaginative! I can not say enough about this place, it is so well done. I hope you are proud…you should be! This is on my Top 10 Tiny Homes list. Beautifully done, Stacy! I plan on doing this, same style barn but just a bit bigger. Hoping to start in a couple of months and what I’m most concerned about starting out is the plumbing. I’ve been told that I need to get it up off the ground in order to hook up the plumbing but I noticed that this one isn’t off the ground so how was the plumbing set up here? It would save me a little bit of money if I could do it that way. I’m living of of one 650 per month already and a single mom with no child support so I know it’s going to take me a lot longer to get it ready to live in. I’m a little nervous but I know with my income it’s the best option for me. Luckily my parents have a spot for me on their property where a mobile home used to sit so the well and electric hok up is already there. Anyway, if someone could answer about the plumbing please email @ [email protected]. I would greatly appreciate it. I just love your cozy home and your sage wisdom. It’s exactly what I want. I admire that you are planning ahead but still very active. I got toward the end, saw your picture and you look like my Mom! She was my best friend and passed 5 years ago. Thank you so much for the day brightener! I swear if you lived closer I’d make you join our craft club LOL. What a wonderful tiny cottage! I really love the practicality of it adorned with a touch of whimsy. I’d want to spend all my time in it, too! A girlfriend and I saw these sheds about six years ago and said “we could make houses out of these!” …that was looooong before I ever heard TH. I still had kids in the pic back then as did she but we’ve both been working towards this for some time now. I’ve got linens very similar to hers and even the same green bookshelf to go over my same little ‘fireplace’. However, different layout etc. But was fun to see a similar “dream” come to fruition as I continue to plan, pare, and prepare. Wow Stacy, good on you, love it! You go girl, head for retirement! Thank you so much for focusing on what I consider a major market, us older folks. Designs do need one level sleeping and lets not forget the advantages of less housework! For me I also need the full size frig and would use the loft for my art supplies/storage. Lovely home. Thanks to both Stacy and Alex for bringing this one to our attention. Reminds me of the 16×12 barn shed I saw at the local Home Depot that really got me interested in the whole Tiny Home movement. Better Bilt Barns are good people with vision. Glad Stacy was able to utilize their talents. i loved the space utilization and creativity.its my dream house. Absolutely super! I totally relate to this barn and the reasons of the owner for building it. Enjoy milady. What a great ideas and a beautiful little home. Felt like I was reading my thoughts on why you chose to do this. Particularly love the stairs as I am nearly 69 and the thought of ladders is daunting. It’s beautiful. I wish you health and happiness in your little home when you retire. Love the story and her planning for her eventually and inevitable demise. Great message and smart gal! Wonderful! Love what she did with this shed. We are doing the same thing but on a larger scale because there is the two of us and two dogs and two cats. My hat is off to this dear lady! I love this lady. I believe she must be my long lost twin sister. I admire what she has done. Would love to do the same thing for the same reasons……..
What a wonderful space. I might just do the same thing on my mother’s property. It would be nice to have a private space closer to her when she needs assistance. Thank you for sharing your tiny home with us. Of all the Tiny Houses I’ve seen this is one of my very favorites! What a lovely little house and set up! I just turned 70 and have been eyeing these little barns for some time. I thought if worse came to worse, two could be secured together with doorways connecting. However, I was pretty sure I could survive in the space of one! Add insulation, wiring, plumbing, a staircase and YES!, skylights and French doors and you’ve got a tiny palace! Congrats and kudos to a kindred spirit! The staircase comes with it. I can’t find the word to surpass any comments placed here about the little barn,With the dog also. 😉 Love it. Stacey, you are such a smart woman!!! I have faithfully been reading about tiny houses on this site for a year, but this is the first time I felt compelled to respond. This is a wonderful story in itself! First of all, I am in love with the stairs. I feel realistically you could climb stairs but not a ladder into your 80s. And the use of the stairway space is amazing. The landing at the bottom essentially doesn’t take up any space by combining it with furniture. The covered deck is a must. So beautiful. It makes the home feel so much larger. Lastly, I don’t like the open floor plan of most tiny homes. Personally, I like a bit of separation from the kitchen, which can be noisy while cooking and cluttered if you don’t get to the dishes right away. Even if there’s no actual door here, it is its own separate room. Also, bathrooms are almost always right off the kitchen. I prefer the location of this bathroom. I am in my early 50 and just recently decided to downsize. I want to live in a tiny home so bad, but have a husband who wishes our 1000sf home was larger. So unless/until I get rid of him, I’m stuck here. However, if I’m ever on my own, something very similar to this will be in my future. Thank you! Stacy: Forgot to tell you before how much I love the staircase (and platform with storage chest) and that wonderful covered deck! If a person were so inclined, they could make a screened-in porch either beside the deck or enclose the deck itself. That way my critters could be outside in a safe manner. Oh, and a little chicken coop beside the garden would be lovely….I’m really getting carried away…hmmmmm—I’m really happy for you, Stacy! I must say I love your home and also your sentiments. This is perfect. What else can be said? This is the same barn that my daughter and I have looked at and thought we would also like to make into our matching ‘tiny homes’ in the next 5 years or so when her hubby is finally retired from the military and putting down permanent roots. I love your little house. Do you have room for clothing? I’m 63 and I get it. Im Just about to build my last house, having just sold the last last farm. My heroes for many years have been Helen and Scott nearing, who lived to ripe old age in maine. The TH on this site really show the possibilities; now we need the regulatory supervision to be on board tho So many elements tend to not meet code. As a builder, these things like safe egress, and non combustibles by the stove, worry me. Please be safe out there! I’m about to do a 400 Sq ft with loft. It will have lots of good insulation so I’ll be warm at the end, hopefully many years from now. Love this and feel the same way about only needing the essentials. Wow! It’s quite wonderful. I especially love the skylights and the deck. I only wish you had included, for those of us who simply cannot visualize, a floorplan. Tiny House Talk, can you arrange that for us, PLEASE!!! Photos are nice, but I’d love to see video footage. Stacey – I just love your house!! It is so welcoming, and so peaceful looking!! Two years ago I downsized to a 400 square foor studio apartment with a deck in an apartment complex in the woods. I have never been happier, especially once I rescued my own Australian Shepherd!! Your Aussie is so beautiful, too! I simplified my life by finding a job close to home, I have been diagnosed with and have beaten ovarian cancer, and I believe living a simpler, more peaceful life made it possible. Life is good when it is simple and peaceful!! Such a lovely nest for a lovely lady. Thank you so much for sharing with us Stacey and Alex your work is also appreciated. 🙂 Rhonda if you only have a small space to work with you might consider the Avanti CK301SHP for a quick tiny kitchenette, also for anyone one might make a “pvc pipe style clothes rack” for your consideration. I’ve done a lot and will continue to do a lot of researching for all aspects of TH living. I think a small place with a deck and chickens will be a great idea for when I’m done moving around in my THOW I plan to get in my future and use up til it’s time to stop moving. The Small Place will be nice to move into and I love this barn style for both roofs. 🙂 God bless you all and Happy Trails! So beautiful. I can feel your heart for this home. Maybe because I’m 74 and experiencing many of the same things you are at this stage of the game. Beautiful……. I have to many questions I would like to ask Stacy. Is there a way to communicate contact her directly? I LOVED this article and have dreamt of having a tiny home sonce before there were such things! But I have many, many questions…and don’t know where to begin. I love everything about your cozy home! Perfect layout, and using the space to the fullest. Love your covered deck and beautiful garden. What an adorable doggie too 🙂 Here’s to many healthy & happy years in your beautiful tiny home! Stacy you have done a great job in taking a space and created heaven for yourself. I am also in the process of down sizing and looking at a barn shed thru Lowe’s. Iam so happy to hear that you are very satisfied with the built. May you have a long and happy life in your new home. My mom is 85 next week, and is moving into a senior apartment. I would love to do this for her on our property. She would be close by, but have her own space. Wonderful job!! Absolutely beautiful! I, 61 and disabled, believe you have been the answer to my prayers. Was wondering if it can be insulated enough against colder weather. Forgive my ignorance in these matters. love this lady and her beautiful tiny home! A perfect house…how artistic you are …your aesthetic sense is amazing. Be still my heart……this is exactly what I have been planning. I hope to get started in the spring. Looking forward to spending this winter dreaming and planning.? Love it, Stacy! Did you insulate the walls or ceiling? This is the best story of a little house I have ever heard…the house is practical and very beautiful. I love how it has nice stairs to the loft, so many little homes don’t have good steps. But the greatest is the owners attitude and preparedness for Her future and what real life is and needs. Love your house.. Did you have to get permits for the barn, plumbing, electric etc? I love this tiny home and your story! It would be nice to make the bottom steps of the stairs into drawers for extra storage! I would love to see these built in small subdivision for senior citizens or for the homeless! Love your tiny house looks so welcoming ? I love your little home. You have decorated it so that it has such a “homey” look to it!!!! This house is exactly what I wanted to create for me at this same point in life – God willing! I would love to know what part of the country Stacy lives in. I think she is amazing and has great heart. Love the beautiful photos! Stacy, you have created a masterpiece! I love your mix of fabrics, the creative use of space, the personal touches that make a home. At 73, I feel myself slowing down and not wanting to deal with rising rents and other costs that remind me too often that my income is fixed. Lucky for me, a family member lives nearby and has offered me a bedroom in their spacious home. However, I still need a personal space, all my own, where I can hang out and pursue hobbies and do some writing. My plan has been to purchase a shed (a bit smaller than yours) and have it insulated and finished as one room, a Grammy Pod. I will not need a kitchen or bathroom since the shed will be near the home. Can’t wait! I just wondered what is all included in the bathroom? And I just love the barnhouse, it is so adorable. I would live there in a heartbeat, guess i better start downsizing. Thank you so much for allowing us into your home.I am 45yrs.old and watching my children turn into young adults before my eyes.I hope i have the forethought and serenity that you have.It will seam like tomarrow that I will be in your shoes. Stacy, I love your house and I share your approach to aging (I’m 67). Thanks so much for posting the pictures of your beautiful house and for your inspirational text. It is a dream to live, scent of flowers, colors floral, taste fantasies in the set: woven, wood, lights and shapes ingredients that give intimate quietness. Thanks so much for sharing. I have a floorplan drawn up for a larger version of a barn shed but had not seen the inside of one that had actually been done. This takes away all my worries. I am 68 and in the process of finding land (the hard part) and this is great inspiration. I’ve had the same dream as you — creating a place on our property where seniors could live in tiny homes. My husband thinks I’m crazy but I’m sure it can be done, despite our prohibitive local regulations. There are a surprising number of individuals, businesses and organizations who offer grants for all sorts of projects. You might try googling “grants for senior housing” or similar search terms and see what comes up. Some may offer grants to only non-profit groups but others might not require you to have a non profit status. Your best bets for getting funding will be from sources in your own community so start there. In my area, banks and utility companies seem to underwrite quite a few projects through foundations they’ve set up to better the community. Your proposal needs to line up with and support the foundations’ stated objectives, and you’ll need a well thought out plan to present to them to be considered. You can research sources for grant money using the internet, where you’ll also find lots of advice on “how to write a grant proposal.” Best of luck, and if you need more info feel free to email me. Love your tiny home! Beautifully completed. What is the name of the paint ? color you chose for the outside? I absolutely love it and would like to paint something that color! It looks greenish blue but hard to tell online. Many Years of Happiness to you and your dog. That’s the very definition of “cozy”. Love it! Wow, well done! It looks so comfortable and cozy. I especially like the reading nook under the stairs and the patio. Lots of places to sit, lounge, dream, pet the dog and peacefully be. This is so perfect I can hardly stand it !! Have looked at so many tiny homes over the last few years. This one is so homey and perfect, I need to run out and get started. The owner could certainly go into business teaching others. Don’t think I could have this on my property and not live there. Makes me think of forest fairies and fresh cookies and lovely textiles. My spinning wheel is calling me now, seriously. Gotta go! Thank you for sharing so much of your life and future Staci. It made me think of “nesting” and isn’t that what we want to do at a certain time in life? Now it’s just for us though and that makes it really special! You’re an inspiration! ? I have a barn shed next to my house I’m excited about someday having as nice a retreat on my land also. I need to have a proper door put on and Windows, stairs and walls…then the wiring and plumbing. I even hand a Window ac unit for the summers out here in az. I love the front deck you put in and the sky lights. Well done, I’m 57 maybe I’ll get mine done by the time I’m 65. Looking forward to letting family visit and I could let them use the main house and then my patterns wouldn’t be an imposition. They also won’t feel like they are living as a guest more like a family visiting next door. Love love love this. Well built, I am happy for you and the best of luck in the future. Stacy, Your place is charming and you will be so lucky to grow old there. A thought – maybe you should move into the little house now and start renting out the main house. That would give you a chance to save a building maintenance fund for when you’re not working and making money. Great story, home and doggie. Perfect! Though I am also wondering (maybe she is by now) why not in it full time , would save money. This is just so beautiful! Exactly what I dream of having one day. Thanks for sharing. Really nice little “nest”! Great job! It’s cute but if she is afraid of not being able to afford her mortgage why would she build the back up house on the same land??? She should have sold her house and land and used the money to get a new property paid in full and then built the shed on that. Now she risks losing the shed and the main house. So she’s paid for the shed now but also continuing to make mortgage payments. Seems not the best financial way to do this. She said she would rent the main house. I could immediately imagine myself living here. So cozy and homey. The only thing I would do would be to add a second shed for an art studio. Then I’d be all set. Hi Stacy. I just found your home and it took my breath away! I have drawn pictures of tiny houses for more years then I can remember but was never able to put it all together until I saw your house. Amazing! I hope you are enjoying it everyday! I just turned 67 and have been downsizing for many years. Life has taken a new direction for me and your story has been put in my path not by accident but as a blessing. Thank you from the bottom of my heart! What a delightful inspiration! Well thought out, practical and warm tiny house. So very homey and quaint, beautiful woodwork touches too!! see how you’ve laid out those spaces? Hi… Love your space! What is the height in the loft? I just love seeing this tiny house…and I will share this with friends and family. I agree with Karen, in that your tastes are so similar to mine, right down to the fabrics and the beautiful dog! I would love to know what breed the dog is, please. Thank you so much for sharing your little home. What a charming home and an inspiring story! Would you share the floor plan! It is brilliant!!! I too love the stairs as ladders at my age are out of the question. I can certainly see why you are looking forward to living in this inviting little home. Perfect for you and your beautiful doggie. I see a lot of tiny houses but this one is the cutest and most well thought out. I compare them all to this one. I even shared the link on Youtube with a barn-shed company that just didn’t have it right. Stacy, I hope all is going well for you. Take care! Beautiful home, similar to what I am hoping to do and about the same size though I was thinking of 12’x17′ as this is a size I can live and work in. It is the $600 soc sec cheques that puzzle me slightly. I am assuming these are your old age pension but is it really only $600 a month. I get $400 a week (disability but the amount will stay the same when it becomes my pension in about 10 years) which allows me to support my daughter as well and put her through college, pay rent, run (tax, insure,maintain) a car so she can start up her own business from home. I can’t imagine trying to do that on $600pm so I can see why you are planning ahead. You have created a beautiful, cozy, and warm little home. 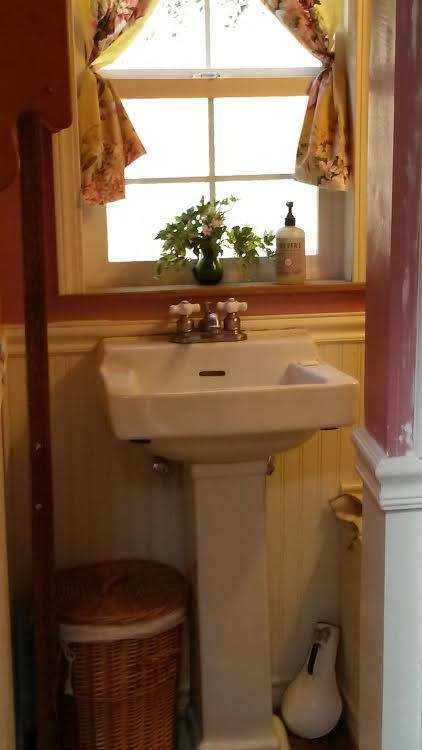 I love, love, love all of the country charm that you have incorporated into the decorating. It is so inviting and welcoming… can you tell? I love this tiny home and it’s truly my idea of what a “golden years” home should be. Thank you for sharing and all the best to you and your pupper. I want to live there! It is perfect! This is the best tiny home I’ve looked at. I want it! Just a really beautiful place to live, love all the floral and gingham fabrics in use that make it feel like a real home. You did a fabulous job on this shed and I so wish I could of thought of this earlier in life for me. I love the furbaby also as I have one of those with me at all times. You go girl, wonderful ideas put into action. I LOVE your house!!!! This is just the way I envision my own future Tiny House looking like. The only thing I can’t figure out from the pictures is exactly how the staircase works. I want a staircase just like this one, so I wish I could see how it attaches to the loft, etc. Super great job!